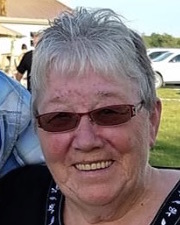 Osborn, MO…….Margaret F. Hughes, 67, formerly of Stewartsville, Mo., went to be with the Lord on Monday, @ Mosaic Lifecare, in St. Joseph, Mo. Visitation will be held on Thursday, November 8, where family will receive friends from 6-8 p.m.
A private family inurnment will follow at a later date at Lebanon Church Cemetery. Arrangements have been entrusted to the Turner Family Funeral Home of Stewartsville, Mo. Margaret was born in St. Joseph, Missouri, to Ernest and Ruth (Kendall) Butner, on January 22,1951. She and husband Louis were married on January 18, 1968, in Plattsburg, Mo. Margaret and Louis owned and operated The Maggie’s Restaurant in Stewartsville for many years. Aspen, Ember, and Presley, numerous other relatives & a multitude of friends. She was preceded in death by her parents, Ruth and Ernest Butner, a brother, Raymond Butner,and a nephew Darin Griffin. Margaret was a faithful wife and beloved mother and grandmother. Memorials: to the family, in care of Turner Family Funeral Home,Stewartsville, Mo. So many memories I cherish of an amazing woman. My thoughts and prayers are with all the family and may you find peace in this sorrowful time. So sorry for your loss… I will not be able to be there for the services, just know I have you in my prayers today and the weeks to come. Prayers and thoughts to all her family..she was a wonderful lady that will be missed greatly! Leave a Reply to Tina Marrs Click here to cancel reply.